Working together to bring relief to our fellow Americans! Has it really been a year since Jane started this site? We went from just a few of us who gathered here to exchange ideas on how to bring relief to rural Alaska, to having hundreds of people visiting here every day brainstorming both short and long term solutions to the issues that face rural Alaska. We remember in the beginning when we first got excited that we had more visitors than board members. Today we have someone visiting AB on average every 6 minutes! What has brought nearly 100,000 hits to Anonymous Bloggers this first year? Let us review. Please feel free to wander the side bar and the archives to see everything we’ve been doing. Here’s the time-line Jane created with a lot of hard work and patience. Anonymous Bloggers our 1st year…a review…..
Jane started AB on January 21st, 2009 but we need to go back a few weeks before that to get a full understanding of why she made this decision. The crisis in rural Alaska came to light when Nicholas Tucker presented a letter to Fuel Summit Participants sharing the stories of people in his village who were suffering. 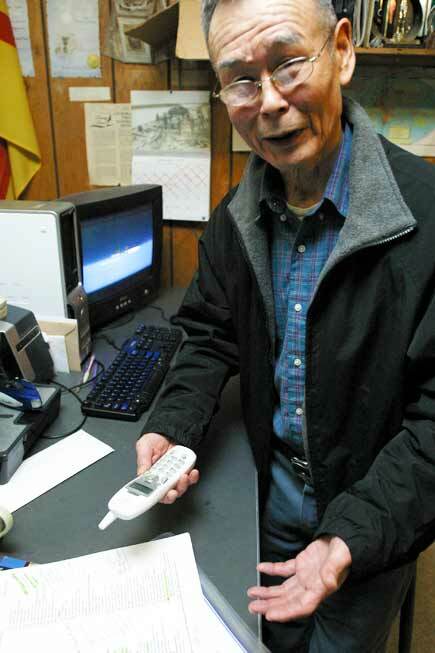 His story was picked up by regional news outlets and eventually became headline news in Alaska. A combination of extreme cold and high fuel prices has created a humanitarian crisis for the village of Emmonak, according to resident Nicholas Tucker. Prominent Alaska blogger AKM brought the crisis in rural Alaska to the attention of hundreds of readers on her blog, TheMudflats, and asked for donations to send a filmmaker to Emmonak to document the situation. The footage eventually appeared on CNN. A Cry for Help from Rural Alaska. Is Anyone Listening? One of our local progressive media heroes, Dennis Zaki of The Alaska Report, is stepping up trying to raise money to get to Emmonak and other villages to put a camera where it needs to be. Many national and international media outlets are interested in seeing footage. Flights are not inexpensive, and he’ll be traveling on his own dime. If you want to help put a spotlight on this issue as it relates to Emmonak and ALL Alaska’s rural villages in crisis, consider donating with the Paypal button below. Emmonak’s Nicholas Tucker interviewed on KUDO. Hope Coming to Emmonak and Beyond? Enough money to pay for Dennis Zaki’s flight has been raised and he is set to depart the following day. Alaska’s Rural Villages in Crisis – Update. January 17, 2009 Thanks to generous contributions to the effort, many coming from Mudflatters, Dennis Zaki of The Alaska Report has raised enough money to pay for travel to Emmonak and other remote villages, to talk to locals on camera, and capture footage for use by the national media. Dennis needed $2000 for his ticket, and will distribute the rest for energy relief when he arrives in the bush. As of this writing, there is $6283. in the account! AnnS left a comment on Margaret& Helen’s blog (a blog that went viral in the fall when Helen made one of many on-target assessments of Sarah Palin’s character) saying that the crisis was more widespread. More people jumped into help. I was asked to come here and blog. I have been blogging on themudflats.net about how it isn’t just Emmonak that is struggling. It’s not just Emmonak that is struggling it’s the entire Yukon Delta. I live in Nunam Iqua, a village that is 25 miles south of Emmonak. Not only are we faced with the same issues as Emmonak but also our crisis is harder because we no longer have a store here. Our trading post collapsed several months ago, so we have no place here to get groceries. The attention the crisis in rural Alaska was receiving in the comments section on Helen & Margaret’s blog caused complaints by some who thought the conversation was to far off-topic. Information about ways to help were strewn across the comments section of a number of blogs – it need a clearinghouse. The first boxes arrive in Nunam Iqua and we started our blog! The first, and maybe only, story in the main stream print media about the crisis was published in the Los Angeles Times on January 25, 2009. Reporting from Tuluksak, Alaska — As the temperature plunged to minus-40 degrees last month, Nastasia Wassilie waited. The 61-year-old widow had run out of wood and fuel oil, and had no money to buy more. Nor was there much food in the house. (CNN) — Thousands of villagers in rural Alaska are struggling to survive, forced to choose between keeping their families warm and keeping their stomachs full, residents say. Victoria Briggs first reported that the suffering extends to the Alaska Peninsula. Before you read any farther please realize we are not putting our hand out for assistance, but certainly do need it! I am a resident in a village that is very small, 10-12 full time residents, that face many of the same issues that the Yukon-Kuskokwim Delta does. Food and donations from far-flung relief efforts begin to make a difference. A wave of donated food and cash has swept into lower Yukon River villages over the past month, with more than 19,000 pounds of supplies and $13,000 landing in Emmonak alone. Update – the first food reached us yesterday, thanx Seattle and MO (forgot the town – is written down – will fill in later) We got a box of food out to each of our most needy households yesterday. Since we hadn’t really said much about what we were doing until we had our food show up, they were surprised, overwhelmed and just so grateful my words can’t say enough. All of you who are working on this have them so surprised that someone actually cares – I can’t tell you the impact that has already made. Sarah Palin announces plan to visit rural villages on February 20. Video of Sarah Palin, upon leaving Wasilla with Samaritan’s Purse personalities to deliver faith-based aid to the villages of Russian Mission and Marshall. She states government is not the answer, faith-based organizations can help in the interim, but suggests young people should consider leaving their villages to find temporary work and return to the villages with the salaries the have earned to take part in the subsistence living skills they are trying to preserve. Nicolas Tucker Sr., the brave villager from Emmonak who brought this crisis to our attention, flew to Russian Mission to speak with Sarah Palin. View a video of their conversation. The last few weeks in February brought some lively chatter in our Cold Weather Gardening threads. We were looking for sustainable solutions to life in the bush and got plenty of ideas and suggestions. Victoria answered many questions about garden tunnels and potatoes as a traditional staple; her growing season and tomatos and the 90 one-day-old chicks she was raising for summer egg production. She told us privately she had been trying to get funds from the Ugashik and Pilot Point Village Councils to attend a sustainable gardening conference in Fairbanks to help start a community garden in Pilot Point but had not been successful. We asked you to come up with creative ways to get her there. 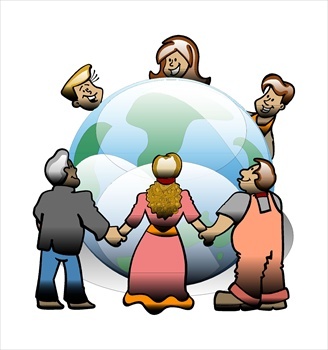 Thanks to all of you I am going to the sustainable/gardening conference!!! L.Gardener stepped up and offered to pay for my plane ticket so it would be a ‘for sure’ thing. Then as people contributed we could gather funds and reimburse her. That is now done with a number of people from all over jumping in to help defray the cost. She shares some of the things she learned in her garden journal. Victoria is a powerhouse! This post is a must-read to get an idea of her energetic enthusiasm in pursuing a more stable and richer life for Native Alaskans. By the end of it she’s already talking about her next project – the salmon bycatch issue! 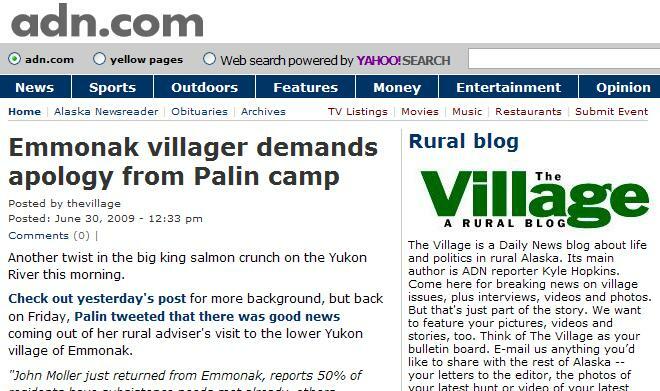 Emmonak’s Nicholas Tucker wrote to AlaskaReport.com editor Dennis Zaki and asked him to print his letter about his dissatisfaction with Governor Sarah Palin’s slow and lackluster response to the food/fuel crisis plaguing the villages of Western Alaska. Our first post about the devastating effects salmon bycatch in the pollock fishing industry was having on the the salmon fisheries rural Alaskans depend on for winter sustenance. We called for people to write letters to the North Pacific Fishery Management Council, which would be meeting in Anchorage April 1-7, demanding they call for a lower bycatch number than the one they were considering. We posted a petition and collected signatures from people from across the US and Canada and as far away as Germany who endorsed a lower bycatch. They were delivered by hand before the March 25 deadline for comments. Victoria, in an update, reported that she and Ann had been invited to attend the North Pacific Fishery Management Council meeting to speak before the council about the effects salmon bycatch is having on rural Alaska. Victoria wrote about her first two days at the NPFMC meeting and continued to live blog through the rest of the conference. Sadly, the 68,392 limit was adopted, not the 32,500 that we had been urging, but Vic gave it all she had on behalf of all of us. Normally it is right around the very end of April or the first of May before we start to see holes in the ice or the river flowing. We usually go through days or even a week or more of open holes and areas of water. Then some breaking up of the river. We woke up Sunday morning, after a night of some winds in the 20-30 knot range and the river was flowing some. Hubby, who grew up in the village does not ever remember it going from basically solid to flowing like this. 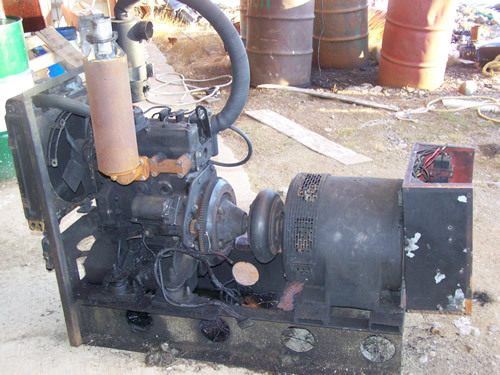 Ann reported that Nunam Iqua’s fuel/stove oil tank had run dry. This happened because the early fall freeze in 2008 prevented their last fuel order from being delivered. The next day, with the food drive slowing down, she and Victoria gave us a detailed update on the situations in their villages. This post offers another glimpse of the monumental task Ann and Vic undertook to help their fellow villagers and the extent to which people from all over pitched in to help. In a conversation Victoria brought up to Ann how busy she was getting ready for the fishing season, and they were in need of a good crew member for summer. After hearing how mostly nonexistent the commercial fishing on the Yukon would be this year, Segundo and Ann decided to take the offer and leave Nunam Iqua to spend the fishing season in Ugashik. Breakup brought it’s own challenges on the Yukon, especially in Eagle Village which was flattened by an ice flood. FEMA stepped up to the plate this time and a plan for sensibly rebuilding the town using kit homes with the help of volunteers from the US, Canada and beyond was completed before winter set in. Bloggers worldwide contributed by donating money and supplies. As breakup continued down the Yukon, communities along the way kept close watch on the flood warnings. Bloggers waited anxiously for news from Ann in Nunam Iqua at the rivers mouth. She sent updates on May 18, May 19, May 22, May 23, May 26 and on May 27 when she reported that planes were able to land in Nunam Iqua and that her family would be leaving for Ugashik the next morning. The Stronghearts arrived in Ugashik. Things are different there, including cooking in Vic’s modern kitchen and bathing in the land of running water! ANCHORAGE, Alaska — According to Gov. Sarah Palin’s posts on Twitter, half of the people in Emmonak have met subsistence needs and the other half believe they can do the same. Palin says her rural advisor, John Moller, recently returned from Emmonak and those were his findings. What was that good news? I asked Palin’s spokeswoman, Sharon Leighow, today in an e-mail. “The good news – At the Federal Subsistence meeting in Emmonak last week, Nick Tucker reported that 50 percent of the residents have met subsistence needs and other 50 percent are confident they will meet their needs,” Leighow replied. Here’s where it gets complicated. Tucker says he never said that and is demanding a public apology from the governor’s camp. “I want them to take it back,” Tucker said in a short phone interview today. 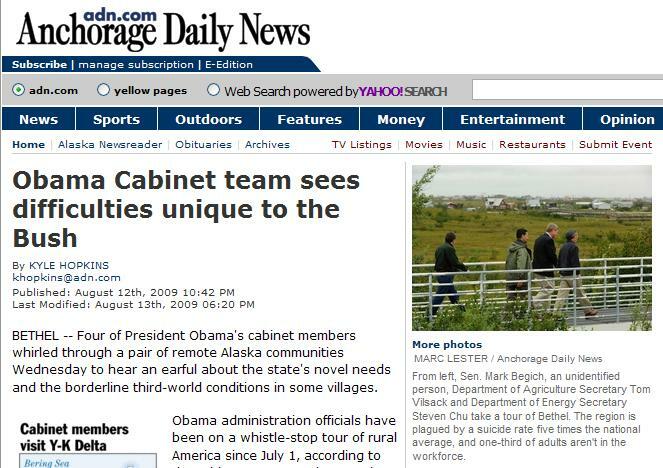 The Alaska Daily News rural blog, The Village, interviewed John Moller, Sarah Palin’s rural advisor, on Wednesday. They we’re specifically interested in the display of civil disobedience in Marshall but, since Moller was just back in the office after being out of cell phone range while fishing, he couldn’t address that so they talked about other rural issues including the Governor’s tweet about Emmonak. So much of this time of year in Alaska, at least the western parts that fish, is rush, rush, rush!! You do any projects that need decent weather, earn most of your yearly income in a few short weeks and, if you can, get the relatives up to visit when it isn’t below freezing. In the past few weeks I felt you needed to see part of what we try to sandwich in all this work, work and more work. Time to view all the flowers, well some call them weeds, that spring up and give us color. The Alaska Department of Fish and Game has banned commercial fishing for king salmon along the Yukon River and is limiting subsistence fishing. The ban is in response to the state not meeting their treaty agreement with Canada for the past two years to deliver 45,000 kings via the Yukon. But groups of Native fishermen are ignoring the ban – facing possible jail time, heavy fines and equipment seizure. How will village residents make it through another tough winter if they’re not allowed to fish this summer? Guest is AnnS from the village of Nunam Iqua. …During the program, moderator Harlan McKosato mentioned that he put in a call to you before the show but never got a call back. Because rural Alaskans are openly voicing their serious fears about the coming winter, we were disappointed that you were not involved in the conversation with Ann and Nick on the air. Rural Alaskans need to know advisors have the ear of Governor Parnell and need to believe that the governor realizes today that things may be even worse this winter for rural Alaskan villages than the previous one…. Alaska’s Governor Parnell Urges Disaster Relief for Yukon Fishery! 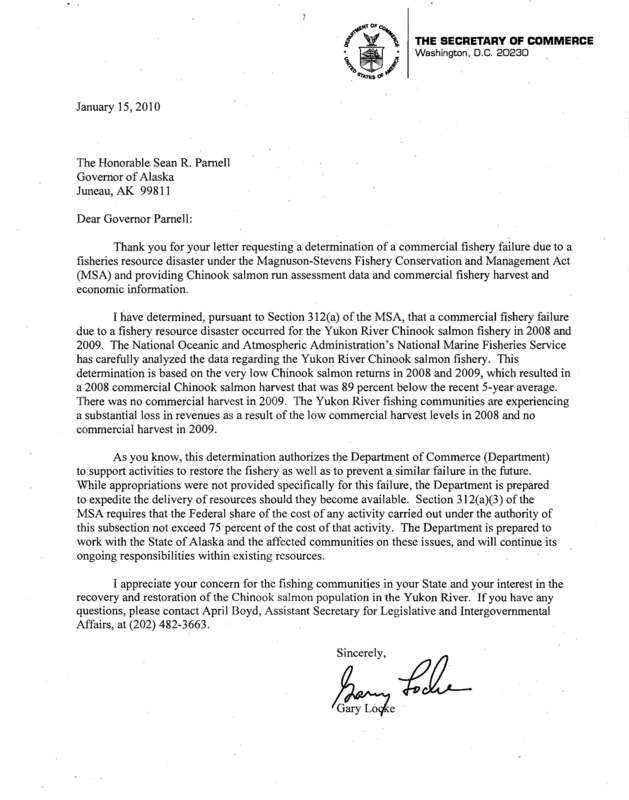 In a letter today, Governor Sean Parnell asked Commerce Secretary Gary Locke to declare a fishery disaster in the Yukon River Chinook salmon fishery. The Alaska Legislature voted Monday to override former Gov. Sarah Palin’s veto of $28 million in federal stimulus money for energy cost relief. But it was as close as a vote can get. (snip) Palin vetoed the appropriation of $28 million in federal energy stimulus cash in May, two months before she resigned as governor. She kept up her fight against the money by posting a message on her Facebook page Sunday. “As governor, I did my utmost to warn our legislators that accepting stimulus funds will further tie Alaska to the federal government and chip away at Alaska’s right to chart its own course. BETHEL — Four of President Obama’s cabinet members whirled through a pair of remote Alaska communities Wednesday to hear an earful about the state’s novel needs and the borderline third-world conditions in some villages. We at Anonymous Bloggers have been trying, in vain, to find out if the rural villages have enough fuel for the winter. We have contacted, with little to no response, the Rural Advisory Panel and the Rural Subcabinet and Rural Advisor Moller and the Attorney General. More than 65 first nations in Alaska and the Yukon are asking the United States’ Secretary of Commerce to ban the pollock industry’s bycatch of chinook river salmon. At its annual meeting held recently at Lake Laberge, the Yukon River Inter-Tribal Watershed Council (YRITWC) voted in favour of a resolution urging Gary Locke, the U.S. commerce secretary, to invoke his emergency regulatory authority and order the pollock industry to reduce its annual bycatch to zero. We were all saddened by the unexpected death of Segundo Strongheart on Tuesday, August 18. He suffered a massive heart attack in the early morning hours and despite immediate attempts to resuscitate him including use a defibrillator under the guidance of medical professionals by telephone, he passed away at 6:00 A.M.
…Not only is the lack of both subsistence and commercial fishing, greatly diminishing our ability to put away fish for the winter but also the lack of funds brought in from commercial fishing is now making it hard, if not impossible, for rural Alaskans to put away other subsistence game. Moose season is now. The birds are flying now. Now is the time to be out hunting for seals and whales. All of these types of game are critical for us to survive this winter. If we cannot purchase gas to go out and hunt then I fear this winter we will have a crisis of much greater proportions than last winter. Last winter we were able to depend a little bit on other game that we had put up for the winter since we were lacking fish. The Obama administration is launching a rapid, sweeping review of the way the federal government manages subsistence hunting and fishing in Alaska, Interior Department officials said Friday. “The system, frankly, today is broken,” Interior Secretary Ken Salazar announced in a video shown at the annual Alaska Federation of Natives convention in downtown Anchorage. Pres. Obama delivered the opening remarks at a White House Tribal Nations Conference and participated in a discussion with leaders from the 564 federally recognized tribes. The conference is addressing issues facing American Indian tribes such as economic development, housing and education. This is the first such meeting since 1994. Washington, DC. The flooding wreaked havoc on the Yukon River ice. The flooding brought in massive amounts of sea ice from the Bering Sea that unfortunately is still clogging the Yukon. Several people lost their fishing nets they had set under the ice and a couple of families even lost their boats during the flood. With all of this sea ice still in the Yukon River at Nunam Iqua it has caused a hardship on the residents. Normally during the winter families will go out onto the river and place fishing nets under the ice to catch fresh fish. 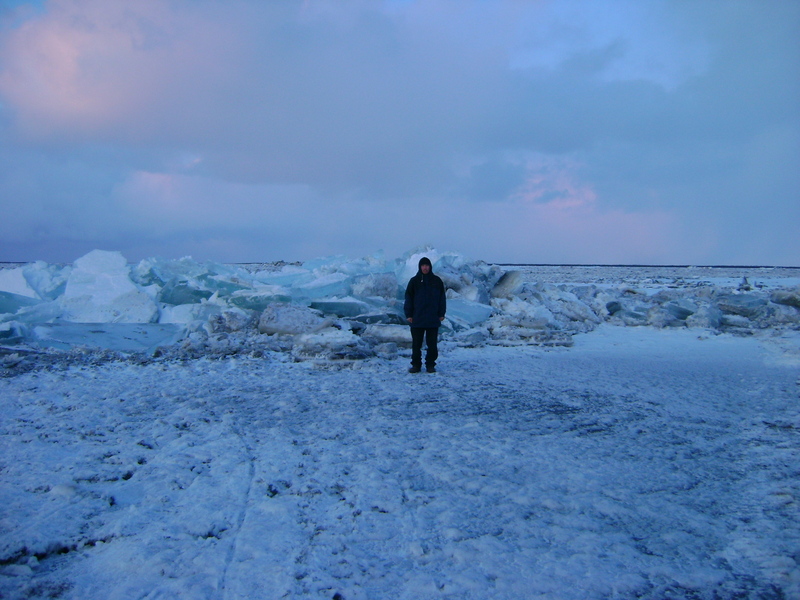 But due to the mess of sea ice currently in the Yukon this has become very difficult if not impossible to do now. Fresh fish caught under the ice with nets is a large staple for families during the winter. Since Ann is spending this winter in Ugashik, she is gathering information for promoting an adopt-a-family program in Nunam Iqua to match donors and families directly. There is some better news this year coming from Pilot Point and Ugashik when it comes to our ability to deal with our winter conditions. Our fishing season was much better this year than last on our main season of Sockeye salmon, although the Chinook/King returns continue to be dismal. Roland Briggs watches new technology, guess it might be the Mechanical Engineering part of his background which keeps him “tuned in”, and he wants to share some of what he sees as exciting. As things cross his path and they look like they might have use in Alaska you will see him post on his new page in our Energy Section. 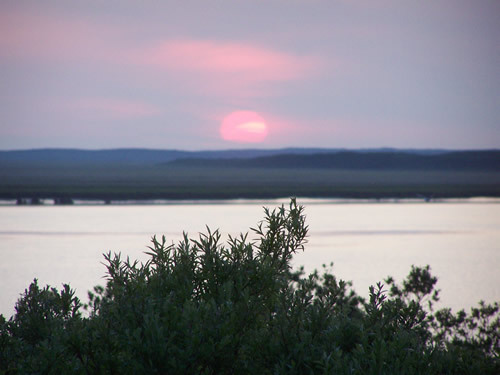 The Alaska Federation of Natives lays out an ambitious agenda that seeks to expand hunting and fishing rights for Alaska Natives as part of the first-ever review of the federal subsistence program in Alaska. In a letter to Interior Secretary Ken Salazar offering ways to improve the program, the statewide Native organization draws on historical arguments and legal precedent to make the case that all Natives, as well as rural residents, deserve priority over other hunters and fishermen. Salazar announced the review in October. The Jan. 7 letter, signed by AFN President Julie Kitka, also asks that the rural subsistence priority be applied to all land and waters in Alaska as Congress originally intended. Governor Sean Parnell today welcomed a decision by Secretary of Commerce Gary Locke finding that a disaster has occurred with the 2009 Yukon River chinook salmon run, opening the door for federal aid to the area. “I appreciate Secretary Locke’s recognition of the severity of the situation along the Yukon River and the dependence of Alaskans on these salmon runs,” Governor Parnell said. 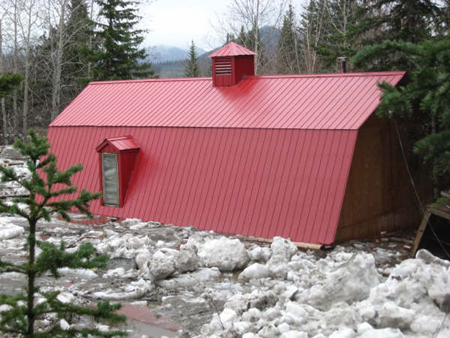 The federal disaster declaration is in response to requests made by Governor Parnell, the Association of Village Council Presidents and the Alaska Federation of Natives. The request detailed the biological and economic situation on the Yukon River and the impacts of the reduced chinook runs. The declaration does not bring immediate aid to the affected area. The congressional delegation must still secure a federal appropriation. Federal aid, once secured, could be used for relief programs, stock research, training programs, fisheries infrastructure, or other regional projects. The river started breaking up last night and we have very minor flooding. Our boardwalk to the airport is still underwater but we’re pretty sure it will go down enough that we’ll make it out tomorrow. UPDATE: We have planes coming in so that means we will be off to Ugashik tomorrow morning, assuming our water doesn’t rise between now and then! We are starting to flood in Nunam Iqua. The river has not broken up yet, but the The boardwalk to the airport is completely underwater right now and it’s coming up to the 2nd set of boardwalks by the housing. We are flooding due to the tides coming in and running into the ice jams upriver and downstream water under the ice. The Yukon River viewed from Nunam's dock. We are scheduled to fly to Ugashik on the 28th. It will be a long day – we leave Nunam in the morning and arrive in Ugashik in the evening. The first leg with either be to Bethel or Emmonak. From there we will fly to Dillingham, King Salmon and then to Ugashik. Flights and route are dependent upon break up, flooding, and weather. The news reported that the village of Marshall had some pretty bad flooding and residents in low-lying areas had to evacuate to higher ground. Emmonak is on flood watch. 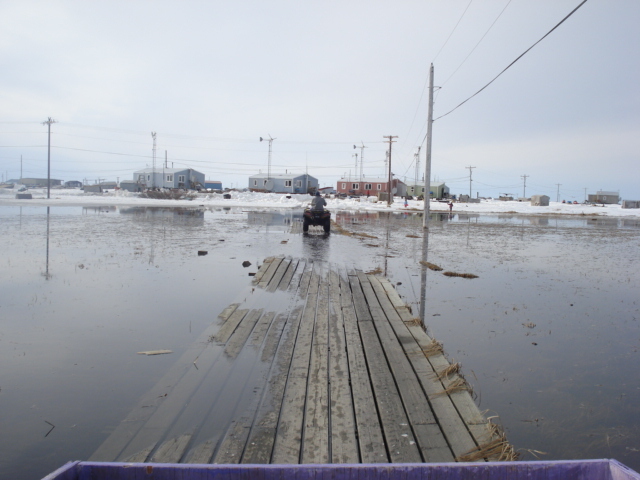 We went down to the dock last night and there is a lot of open water on the river. There is still lots of ice and it hasn’t started shifting yet. The river ice has started moving up and down with the tides again. I asked a relative whether she thought we were going to flood, and she replied that it really depends on how the coastal ice breaks up and jams even if the river break up looks normal. You know how sometimes you start talking about one thing and something much more intriguing comes up? In a recent post I mentioned Victoria has reported the beginning of the river breakup in Ugashik. One of our commenters, problem child, wondered about traveling between villages during breakup. “It’s ALWAYS dicey, even when we have 4-6 foot if ice. It can be thin in areas; it can be broken underneath by a heavier vehicle going over it – like cars and light trucks. Roland and a friend got caught in that this year, when all looked safe. Smelt Derby? Time for a momentary subject change! Smelt are a little fish that swim many rivers in the west, both Alaska and other areas. Maybe like a big sardine but not as strong tasting. The derby happens each year during Winter Carnival in PIP. ALL ages drill or chop a hole in the river in this one traditional area on certain day and during a 3-5 hour time limit, they see who can catch the most smelt. It is just done a stick, line and homemade hook. Most times lately it is a young lady who wins. Prizes and much bragging rights are awarded for the winners. Even the littlest, 4-5 years do it. “…Getting wet even a mile from the village can be life threatening. John, our friend did get wet up to his thighs, 6’4” guy, and had to be rushed home to thaw. We have a month or more, depending on weather when it is plane travel only. No boats can go and traveling by snow machine is out as is the 4 wheeler. Ice goes through a few stages before it breaks up, opaque looking and then needle or honeycombed where it looks good ‘til you step on it. Lakes that freeze all the way to the bottom now are thawing so they have lifted off the bottom and the ice floats. It is probably still safe in places, but you must know them lake by lake. In our area between PIP and here are about 10 lakes of all sizes we cross to get there. Creeks are the fist to open and might be only 2-3 feet across but 6-10 foot deep – VERY deceiving.